Reference: Item No. 1, 2, 3 and 4 of the Minutes of the National Anomaly Committee held on 17th July, 2012 circulated vide DOP&T OM F.No. 11/2/2008-JCA dated 13th September, 2012. Kindly refer to Para No. 8.1 of the Minutes of the Meeting of the 6th CPC National Anomaly Committee held on 17th July, 2012. This is with regard to Item No. 1, 2, 3 and 4 i.e. fixation of pay in revised Pay Scale. 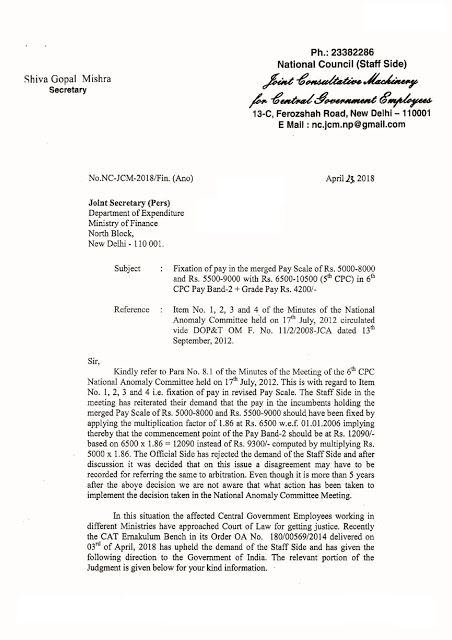 The Staff Side in the meeting has reiterated their demand that the pay in the incumbents holding the merged Pay Scale of Rs.5000-8000 and Rs.5500-9000 should, have been fixed by applying the multiplication factor of 1.86 at Rs.6500 w.e.f. 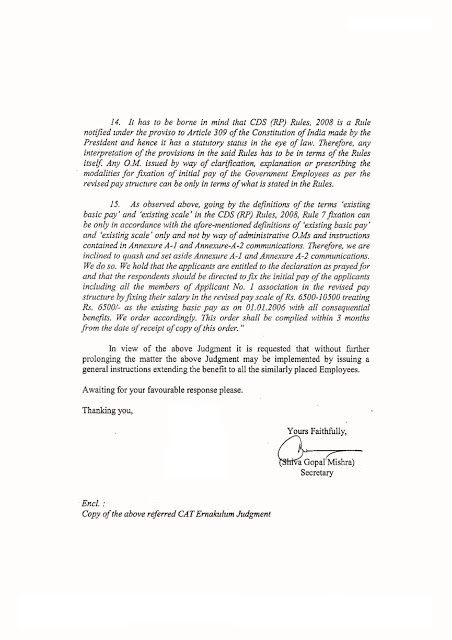 01.01.2006 implying thereby that the commencement point of the Pay Band-2 should be at Rs.12090/-based on 6500 x 1.86 = 12090 instead of Rs.9300/- computed by multiplying Rs.5000 x 1.86. The Official Side has rejected the demand of the Staff Side and after discussion it was decided that on this issue a disagreement may have to be recorded for referring the some to arbitration. Even though it is more than 5 years after the above decision we are not aware that what action has been taken to implement the decision taken in the National Anomaly Committee Meeting. In this situation the affected Central Government Employees working in different Ministries have approached Court of Law for getting justice. Recently the CAT Ernakulum Bench in its Order OA No.180/00569/2014 delivered on 03rd of April, 2018 has upheld the demand of the Staff Side and has given the following direction to the Government of India. The relevant portion of the Judgment is given below for your kind information. 14. It has to be borne in mind that CDS (RP) Rules, 2008 is a Rule notified under the proviso to Article 309 of the Constitution of India made by the President and hence it has a statutory status in the eye of law. Therefore, any interpretation of the provisions in the said Rules has to be in terms of the Rules itself Any O.M. issued by way of clarification, explanation or prescribing the modalities for fixation of initial pay of the Government Employees as per the revised pay structure can be only in terms of what is stated in the Rules. In view of the above Judgment it is requested that without further prolonging the matter the above Judgment may be implemented by issuing a general instructions extending the benefit to all the similarly placed Employees. Awaiting for your favourable response please. Decision has been taken and revised pension has been fixed by multiplying 6500 by 1.86 and adding 4200 gp to this. . In most of the department arrear has also been paid. The revision of pension of 6500-10500 is applicable to the pre 2006 pensioners who retired in the scale of Rs. 5000-8000,5500-9000. If so please clarify.